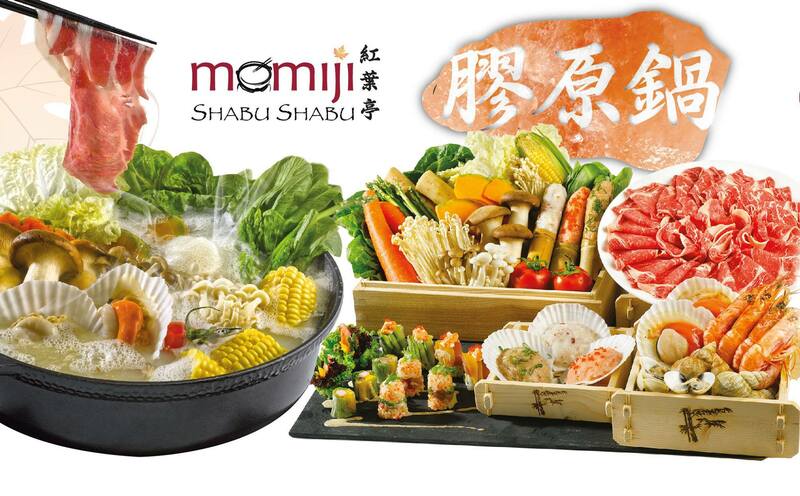 Singapore’s 1st and Only Collagen Hotpot Buffet – Only at Momiji Shabu Shabu! 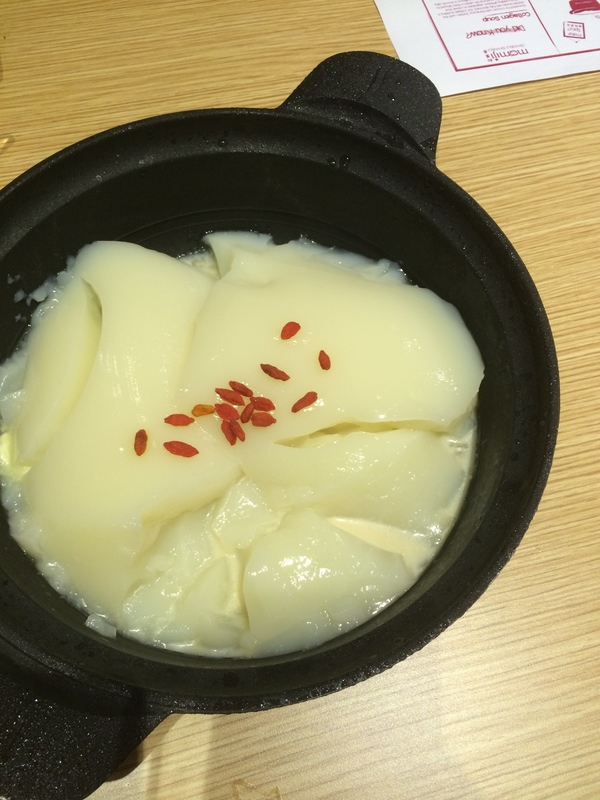 Ever heard of hotpot with collagen as soup base? 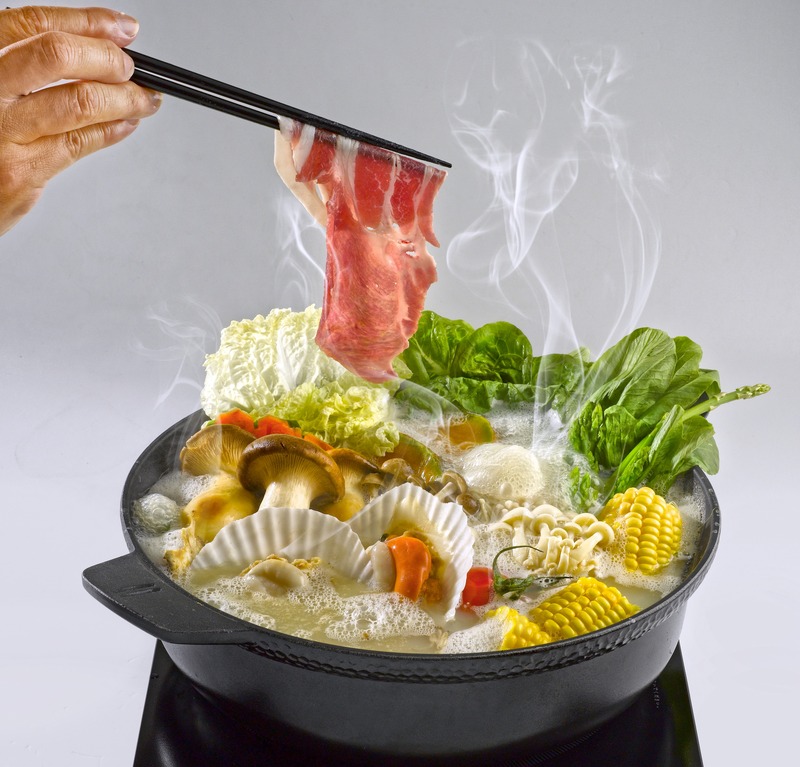 At the newly opened Momiji Shabu Shabu Japanese Buffet Restaurant, you can finally have a taste of Singapore’s first ever collagen hotpot buffet! 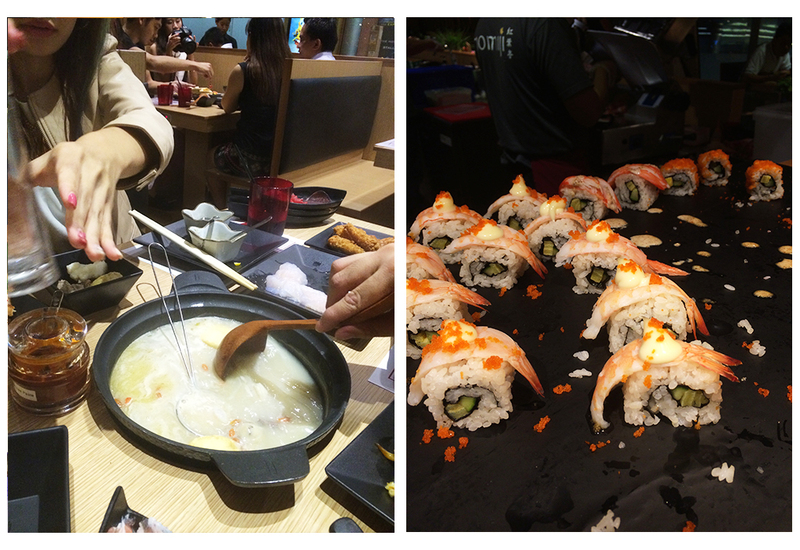 With over 100 items to be enjoyed at affordable prices, Momiji Shabu Shabu promises Singaporeans a wonderful and unforgettable gourmet experience. Complementing the collagen soup are over 100 items including delicatessens such as Kurobuta pork, half-shell scallops, deep red sea prawns, Asari clams and more. Needless to say, this buffet session is definitely a splendid indulgence at a very wallet-friendly price! Collegen pudding before melting into soup. The hotpot’s divine soup case is made of collagen pudding, which is the culmination of 6 hours of simmering kampong chicken. Such long hours of simmering ensures that the chicken bones are fully dissolved – every bit of goodness goes right into the broth (and therefore into our eager tummies). Fresh vegetables are also added in to lend even more nutrition and flavour. At last, the broth is cooled and solidified into a silky smooth pudding that brims with collagen… and Voilà! It’s done. Try grinding the Himalayan Pink salt by yourself! Out of curiosity, we picked up this bottle of condiment that was in a light shade of pink, only to realise it was the Himalayan Pink Salt! Did you know that the Himalayan pink salt is a natural and pure mineral substance gathered from the Himalayas, and has been used as a natural medicine for thousands of years? 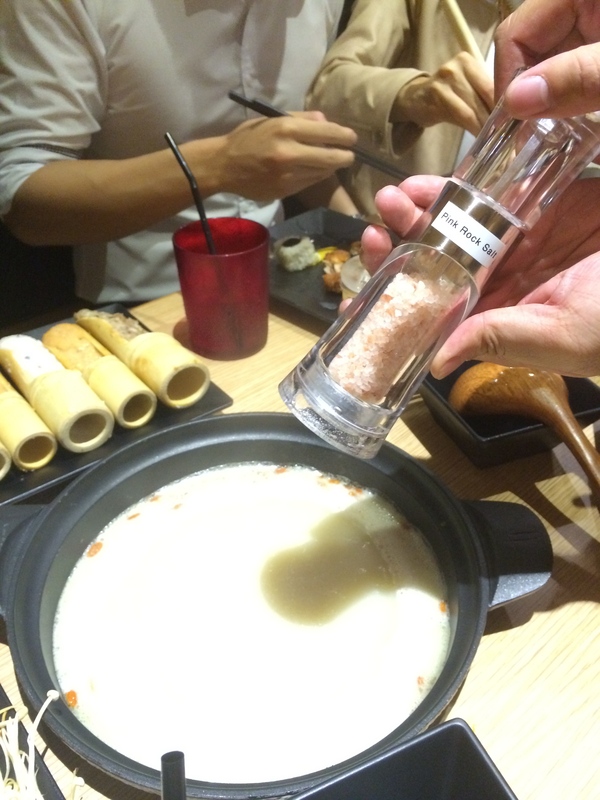 We were encouraged to take the enjoyment up a notch by grinding the pink salt into the soup by ourselves. Not only was it a fun and simple hands-on experience, ths magical pink salt made the soup’s flavour even more incomparable. However, this is up to individual’s personal taste; other than the Himalayan Pin salt, patrons can also choose to customise the soup flavour to their liking with Collagen Shoyu or Hot Kimchi Paste. There are over 100 items to tuck into, from a wide variety of sushi to bouncy fish balls, handmade bamboo meat pastes to crunchy vegetables. Sliced perfectly, the shabu shabu meat literally melts in one’s mouth. Fresh seafood is also available for selection. Don’t forget to pair these delicious and fresh ingredients with the unique dipping sauce you can create from a total of 12 different dipping sauce choices! For dessert lovers, a wide variety of cakes and ice-cream are also available to complete your meal. Calling out to all Shabu Shabu lovers! 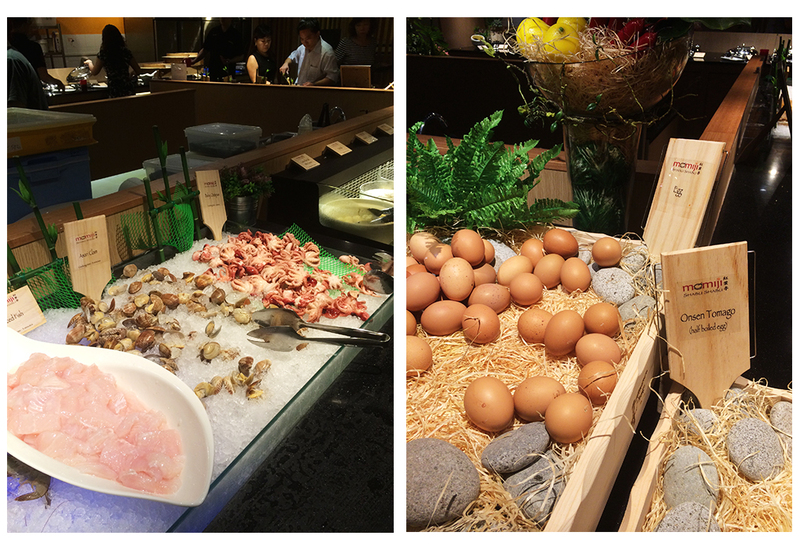 For every two pax dining in, patrons will get a complimentary premium item of either Wagyu beef or snow crab! For more information, visit their Facebook page at http://facebook.com/Momiji.JapaneseBuffet. Suki Sushi Pte Lte was established in July 2002 with its flagship outlet nestled in Lot One Shoppers’ Mall. Over the past few years, Suki Group has expanded its stable of food businesses – offering Japanese cuisines and international buffets – and opened over 25 outlets in Singapore through eight concept restaurants, namely Sakura International Buffer Restaurant; Momiji; Sakura Charcoal Grilled & Shabu Shabu; Nihon Mura; Kagetsu Ramen; Tsuru-Koshi; Saboten and the new restaurant franchise Chabuton. Each restaurant presents a unique dining experience and showcases the vast array of Japanese cuisine.